Play Labs offer a safe space and creative support for Deaf and disabled artists wishing to explore raw ideas and fresh stories for live performance. In order to apply, you will need to send in a proposal. Your proposal should answer the following questions in one document (Word or pdf). 1. Tell us about you. In a short paragraph, describe your skills, experience and interests in no more than 400 words. This could be any courses you’ve done, performances you’ve been in, the kind of work you like and the kind of work you’d like to make, influences etc. 2. Pitch us your project in no more than 400 words. Tell us a bit about your project. For example, you might want to tell us about: the story, the characters, the setting, how you’d like to tell this story, which mediums you’d use (for example: dance, music, puppetry etc). 3. What is the one question you wish to explore in the Play Lab? If you’re stuck for finding your question think about what attracted you to the idea in the first place. Was it the subject matter or theme, personal experience, how you’d make it work for live performance etc. Think about who will be in the room. How would bringing them all together in one place help you to explore your idea? 5. A proposed breakdown of your creative team (this could be actors, a choreographer etc) plus a basic budget. Please note that successful applicants will work with a Graeae dramaturg and/or director, who will co-facilitate the play lab day. You don’t need to include fees for the dramaturg and director in your proposed budget. An example of your proposed budget could look something like this. All access costs will be covered (additionally to your budget). 6. Show us where the Play Lab fits within the bigger development and delivery of your project. Tell us about what you have already done with the idea, any ground work you’ve laid. You could also give us some context as to how you arrived at the idea. Following the Play Lab, where do you see this idea going? 7. If you have existing material that will support your application, such as sample writing or a link to your work, you are welcome to send this in but this is not obligatory. Supplementary material must not exceed 10 pages and no more than 4 links. This could be an extract from a full length play, a short play, a poem/spoken word piece. Anything you feel will give us an idea on the kind of work you make. Unfortunately, we are unable to give feedback on unsuccessful proposals. 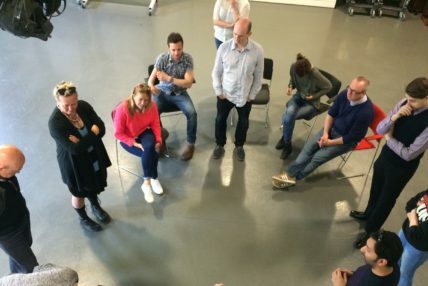 Successful Play Lab applicants will be invited for a meeting with Graeae w/c 24 July. Play Labs will take place w/c 4 September. All applicants must identify as D/deaf and/or disabled. We welcome applications from artists that live and work across the UK. We welcome applications in English and BSL.